This week’s winner has pulled off an impressive feat. We’ve remarked several times that candidates in the past that appeared to be locks to win Twitpic of the Week have be usurped by others we came across later in the week. This photo survived all comers since its candidacy was announced back on July 7th. It has also captured, unexpectedly and for the first time, how I arrive in Vegas. It’s a picture @CaptainXDave brought to our attention that @KTNV tweeted during the 4th of July Fireworks. 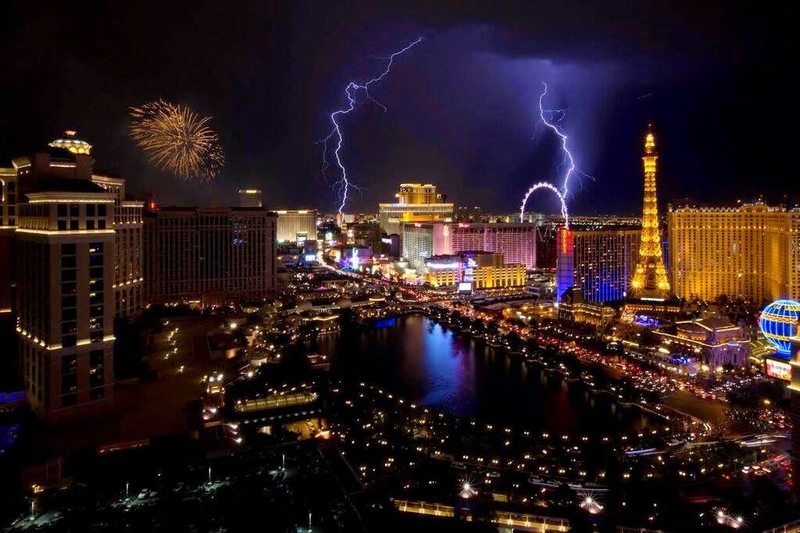 It’s of two bolts of lightening, appearing to hit Vegas’ two tallest attractions, Stratosphere and the High Roller, during the 4th of July Fireworks, although the photo only captures one in mid burst, over Caesars. This photo was taken at night from a balcony at Cosmopolitan looking north over the Fountains of Bellagio. So many metaphoric translations could be made of this photo but I think my favorite is dueling Manzes in Vegas. Mother nature vs. the fireworks. And also, I travel via lightening like Thor.